"We're gonna put the money we raise here tonight into the hands of the poorest people�so they can put their lives back together." None of us are immune to or exempt from tragedy, but it's easy to see a particular connection and empathy between New York and New Orleans in recent years�so it comes as no surprise that the city that bore the brunt of the 9/11 attacks played host to a benefit concert held on behalf of the victims of Hurricane Katrina. (Let me cop to personal connections to both cities. I'm a New Yorker, and my whole family lives here; my lovely wife is a child of New Orleans, and her family was forced to evacuate their city because of Katrina. They were more fortunate than many, as their neighborhood, the Garden District, didn't fare nearly as badly as, say, the Lower Ninth.) And so it's that impromptu spirit of good will that informs this concert, which brought together New York headliners with some of the brightest lights of New Orleans music just weeks after Katrina hit the Crescent City, and is peppered with non-musical celebrities who have put aside partisan differences, at least for one evening, in this effort to help our fellow Americans. There are all kinds of highlights, though most of them come from unexpected pairings and covers rather than from stars putting their signature tunes through their paces. Though there are some nice instances of that, too, starting with Clarence 'Frogman' Henry, whose Ain't Got No Home is one of the most spirited novelty songs ever cut. 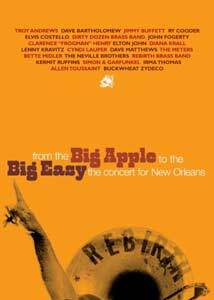 Aaron Neville brings great emotion to Sam Cooke's A Change Is Gonna Come, which has a newfound poignancy in this context; Irma Thomas sounds great on Time Is On My Side, but she seems to be having an even better time when she's joined by The Dixie Cups and Cyndi Lauper for Iko Iko. All the musicians are backed by a great house band, a group that may sound their best behind Ry Cooder, Buckwheat Zydeco and Lenny Kravitz, each of whom bring some New Orleans flavor�Cooder's version of Fats Domino's My Girl Josephine is especially winning. Introductions and information about the purpose of the concert come from a variety of celebrities�the master of ceremonies is Ed Bradley, who gets assistance from Scarlett Johansson, Paul Newman, and, oh, a guy named Bill Clinton. Jimmy Buffett gets more stage time than anyone, and he seems to be having a hell of a time, teaming with Dave Matthews on Neil Young's Heart of Gold, and with Paul Simon on Sea Cruise. And Buffett greets the emcee with his signature song: "Are you ready, Brother Bradley? We're going to Margaritaville, New York." Clinton introduces John Fogarty, whose Born on the Bayou is anthemic for an evening like this, and who gives an uptempo rendition of Proud Mary. Diana Krall and Troy Andrews are more subdued on another Fats Domino tune, I'm Walking, and Art Garfunkel teams up yet again with Simon on Mrs. Robinson. Far more moving, though, is their version of Bridge Over Troubled Water, with Garfunkel and Neville trading lead vocals. This being a New Orleans benefit, the evening concludes with Amazing Grace and then the town's signature song, When the Saints Go Marching In, with the ReBirth Brass Band coming in through the aisles�it's a musical celebration for a great cause. Image Transfer Review: The contrast level is a bit too high on this video shoot, but the transfer gets the job done without much visual interference. Audio Transfer Review: Many of the performers actively encourage the audience to sing along, adding to the sense of fun and camaraderie, but the mix gives us a little too much of the ambiance�it's always a struggle to find the right balance with a live concert, but it sounds like the pendulum swung a little too far in one direction on this one. Extras Review: The accompanying booklet includes brief essays from Quint Davis, who organized the concert, and James L. Dolan, the owner of Madison Square Garden�the good will of the latter goes only marginally toward me forgiving him for how he has overseen the dismantling of my once-proud Knicks. This benefit concert to assist one of America's great cities provides three hours of great music, and buying a copy is just one small thing you can do to help the people so devastated by Hurricane Katrina. The beignets don't taste quite the same on Seventh Avenue, but everybody's heart here is in the right place.